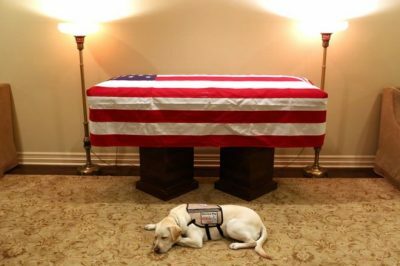 The late President George HW Bush’s service dog, the adorable Golden Labrador named Sully, has been picture resting beside his former master’s coffin in an incredibly moving (and 100% heartbreaking) tribute. Mr. Bush served as the 41st US president between 1989 and 1993. He also, very sadly, passed away late on Friday at the ripe old age of 94. And his trusty four-legged companion, Sully, will be traveling with Bush’s casket on the flight from Texas to Washington DC later on today, where Mr. Bush’s body will lie for the week in preparation for a day of national mourning. The coffin will be flown from Texas to DC on board Air Force One – temporarily renamed Special Air Mission 41, in homage to the late president – and then back on Wednesday, with Sully accompanying the body throughout. Social media users thanked Sully for his services and commented on his and dogs’ loyalty generally towards their owners. If you didn’t know already, Sully was actually named after the airline pilot Chelsey “Sully” Sullenberger – the guy who heroically landed a passenger jet on top of the Hudson River way back in 2009, saving every single one of the 155 passengers and crew on board in the process. What a namesake! 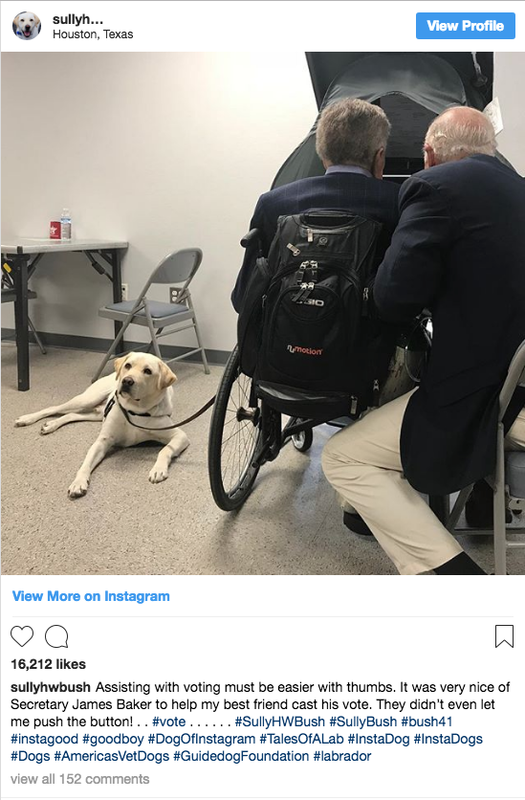 The two-year-old Labrador was only assigned as a service dog earlier this year to Mr. Bush, who had to use a wheelchair in the last remaining years of his life. But clearly the bond they made in such a short space of time was one that is hard to break. And he’s not JUST adorable, he’s actually a very talented, highly-trained, skilled dog. Sully can perform a number of commands, which includes opening doors and fetching items, such as a ringing phone. But what will the little fella do now that Mr. Bush will no longer need his services? Well, don’t you worry! It’s been reported that Sully will still be working as a service dog, but this time he’ll be assisting with therapy for wounded soldiers. In fact, Sully is so popular, he even has his own Instagram account. Below is an image of him “assisting with voting” while Mr. Bush cast his own ballot in last month’s US presidential mid-term election. You go, Sully! 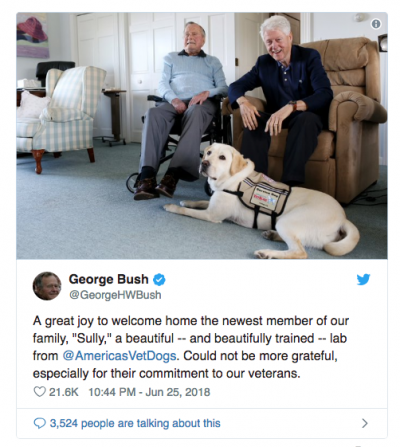 Although I’m sure Mr. Bush loved the time he got to spend with Sully, not all US presidents have been too fond of dogs. John F Kennedy, for example, was allergic to them… and Donald Trump doesn’t have a dog of his own either. President Bush had been receiving treatment for a particular form of Parkinson’s disease, and had been admitted to hospital due to a blood infection in early April of this year. It is reported that he will be buried t the presidential library in Texas, alongside his wife, Barbara Bush, who also died a mere 7 months ago. 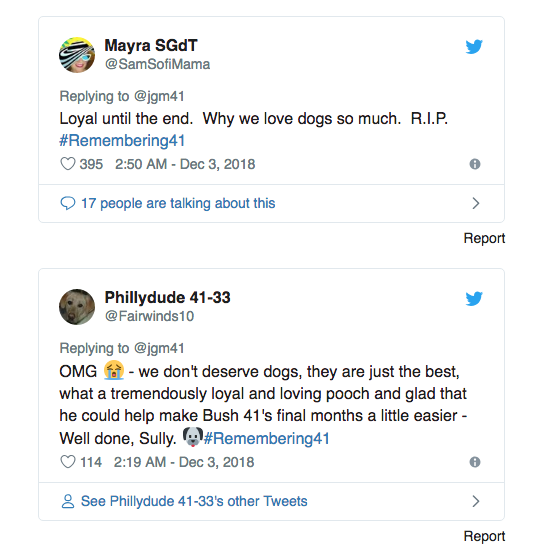 Keep up the great work Sully!